Article contributed by Field Staff Writer J. McFarland. 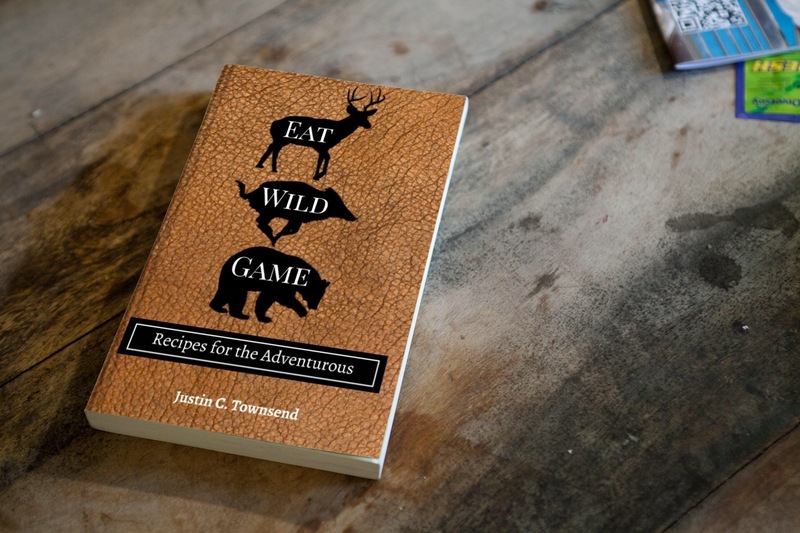 The aim of this article is to ramp up your mental and physical capabilities towards hunting for extended periods of time in the backcountry, off-trail, in steep and rugged terrain during inclement and severe weather. 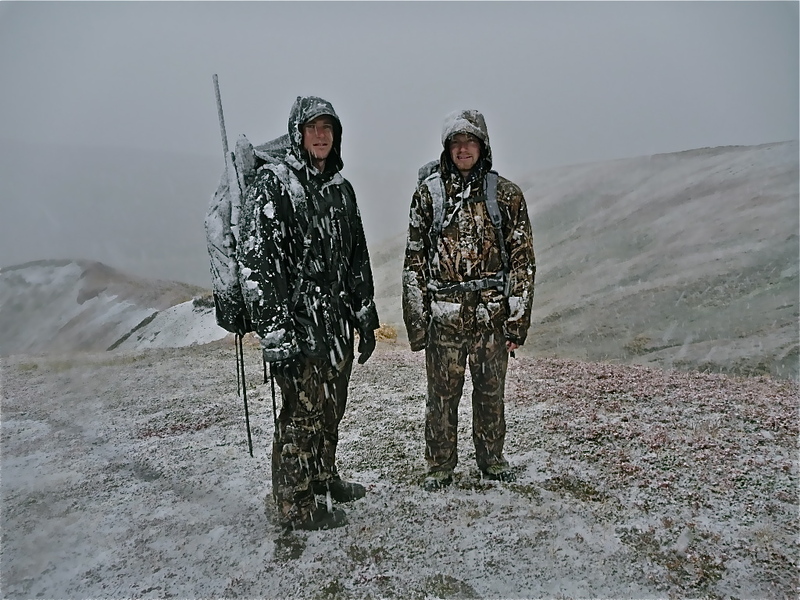 Coming from Alaska, the majority of my hunting trips involve multi-day or week excursions where I regularly pack heavy loads through some of the most demanding terrain and brutal weather on the planet. 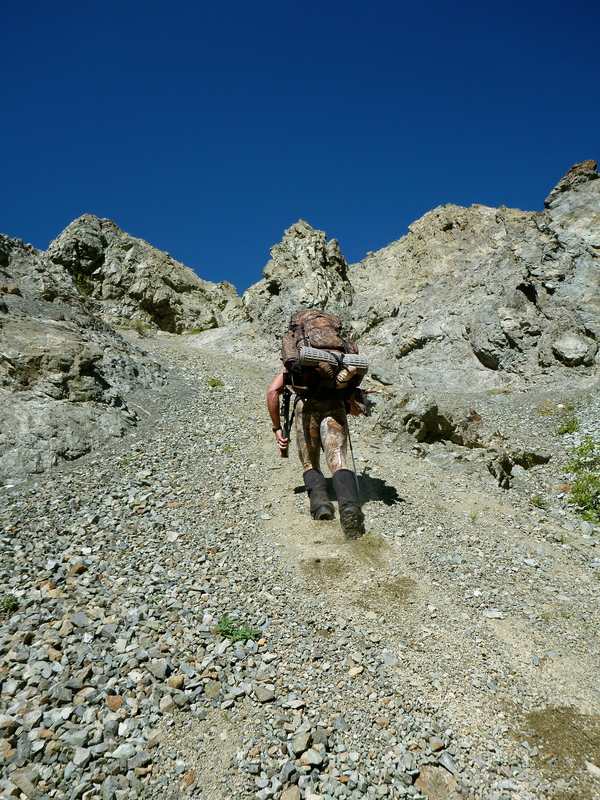 For this type of hunting, all gear and provisions are packed in and out using nothing but leg and lung power. Hauling out game requires multiple trips, and taps every bit of grit from deep within to make it back to the truck or landing strip. Success on such expeditions is a measure of knowledge, gear, and above all else, mental and physical toughness, which I define as â€˜mountain strengthâ€™. This picture was taken late Fall (Sept.) at the front end of a big and unexpected two week storm that trapped us in the mountains for 4 days while moose hunting. 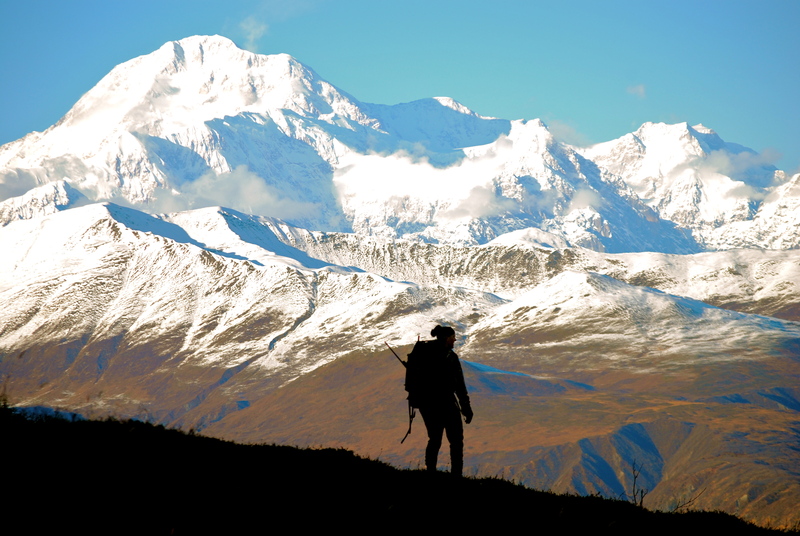 Your attitude and mind set is the most influential factor driving virtually every aspect of mountain hunting. If your mind is not in the game, physical fitness is out the window, regardless of how â€˜good of shapeâ€™ you are in. Those whom are truly mentally tough have a relentless desire to be successful and are willing to sacrifice all comforts in order to achieve the goal at hand. They are the type that can withstand the continuous rigors of packing monstrous loads, excel when being cold and wet while enduring ripping wind with extreme temperatures, yet remain highly motivated. 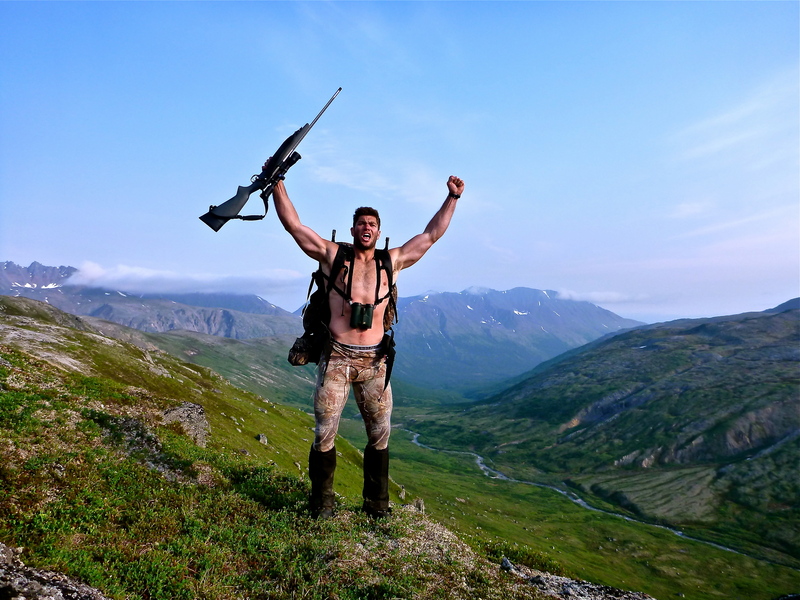 I ran into a guy once who smoked a pack of cigarettes and drank a case of beer every night (needless to say he does not regularly exercise), yet he successfully hunted in some of the roughest mountains in Alaska. I asked him how he did it, and he lit up another cigarette and said â€œIf you want it bad enough, you can do anythingâ€ â€“ and thatâ€™s the truth. Being in the best shape of your life and buying all the fancy light weight and high tech gear in the world will do nothing if your mental game is not on point. So why be physically fit if all we really need is mental toughness? Because the combination of mental and physical strength is literally a deadly mixture that can take you places and lead to successes that you previously never thought possible. – Increase mental prowess through physical fitness training. High intensity training can increase self-discipline and your ability to be comfortable with being uncomfortable. – Make it a lifestyle. Mental toughness atrophies if not consistently engaged. Push yourself in every facet of life, and it will carry over to when you need it most on the mountain. Despite going as light and minimalistic as possible, mountain hunting requires a lot of gear! Pictured is drying everything out on a rare bluebird morning on day 6 of a 10 day sheep hunt deep in the Wrangell Mountains, AK. While isolating lifts (like bench, curls, etc.) might look good at the beach or in your selfie portfolio, they will not get you very far in the mountains. Mountain strength and power comes from your legs and core, so focus on them. Legs are your main power source, and cannot be over emphasized. Core strength (lower back, hips, and abs) are essential for safely maintaining heavy loads for prolonged distances. 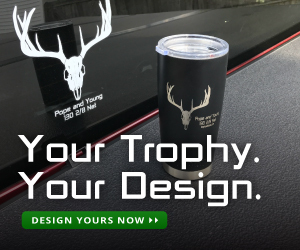 By strengthening your body you not only protect yourself from injury, but also prolong the ability to withstand the rigors of mountain hunting. Compound exercises that incorporate multiple muscle groups and require balance (like body weight excises and Olympic style lifts such as power cleans and snatchs) are hard to beat. Strength train at high intensities at least three days a week (preferably 5-7 days), and focus on different muscle groups every other day. – Perfect form comes first and foremost: Never sacrifice lifting form over moving heavier weight. If unsure about proper exercise techniques, consult a personal trainer or use online resources. – Always have a short and long term plan: Short term refers to what specific exercises you will do each day of the week and what order. Long term refers to your fitness goals per month, year, etc. – For every push, there is a pull: Over or underworking complementary muscle groups invite injury and reduce overall strength. For example, when working quads, equally work hamstrings. The same goes for abs/lower back, chest/upper back, biceps/triceps, upper body/lower body, etc. – Get in the routine of working out, but NEVER a routine of the same lifts: Constantly switch up the exercises. For example, regularly swap barbell lifts with dumbbells-both two handed and one. 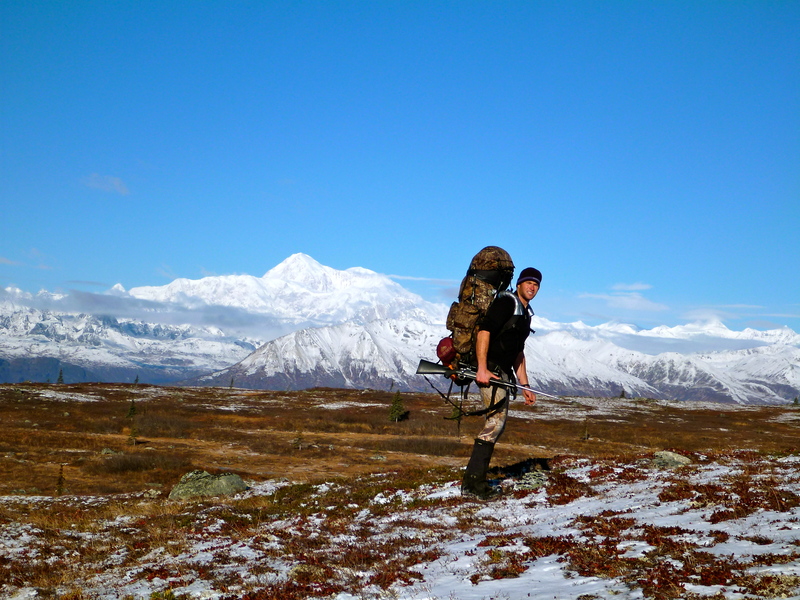 Big mountains and packs while sheep hunting high in the Wrangell Mountains, AK. Maintaining high energy levels and efficiency while hiking all day in oxygen deprived steep terrain with a heavy pack requires a healthy dose of endurance. Proper training should incorporate low-intensity (ex. long distance runs, hikes, hill climbs, etc.) with high-intensity (ex. short distance hill sprints, stair runs, swimming sprints, etc.) workouts. 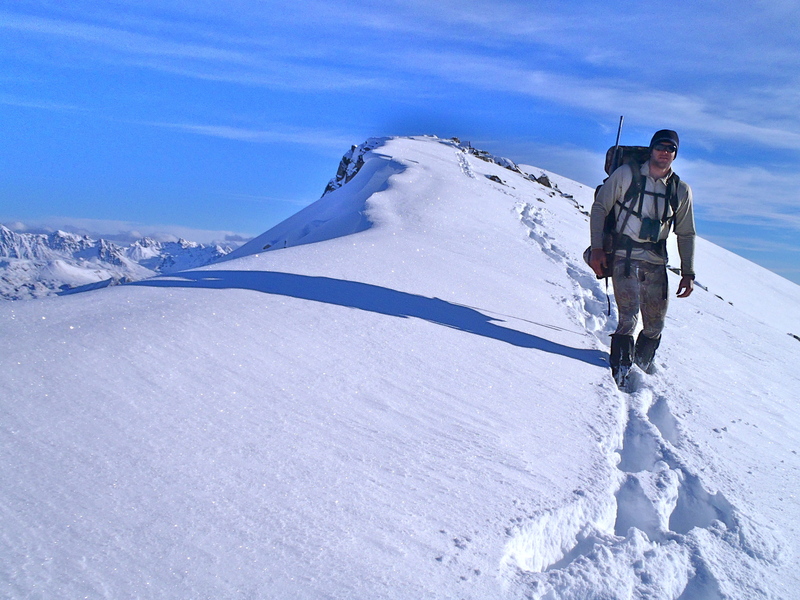 When hiking, wear the SAME clothes, boots, and weighted pack that you will use on your hunt, not only to familiarize yourself with your gear, but to weed out problems (blister causing boots, uncomfortable pack, etc.). Train for endurance at least three days per week, and like strength training, always mix up your routine. – Set goals (ex. for distance and time) and make it a point to achieve them. This is also a great way to hone mental discipline and toughness. – Train as much as possible on uneven ground and off established trails. Mountain travel off established trails is NEVER flat. Traversing over logs, rocks, roots, etc. is substantially more difficult than the flat surface of pavement and established trails. A large storm dumped 3+ ft. of snow overnight while on a late season bear hunt in the Alaska Range, AK. The only way we escaped the mountains was by climbing straight up to the top of a peak and followed high ridgelines (where the snow was wind-blown and not as deep) all the way out. Athleticism refers to agility, coordination, and balance, which regardless of your God given ability, can ALWAYS improve. Increased athleticism can considerably reduce the likelihood of injury prone falls or slips. When packing heavy weight in treacherous terrain, even the slightest of slip ups can be disastrous, and you should do everything in your control to reduce that risk. Incorporate athletic movement exercises into your existing training regime. For example, various ladder-running exercises, box jumps, and cone, tumbling, and high knee drills can be intertwined with endurance based workouts. – By conducting proper strength and endurance training, you are also inadvertently expanding your athletic capabilities. (ex. Olympic style lifts, running over logs and adverse terrain, etc.). Load of bear being packed out solo from the Talkeetna Mountain Range, AK. Mountain strength is built upon a foundation of various mental and physical exercises, through comprehensive training regimes that include significant variety. It is an indefinitely sustainable lifestyle, whose workouts and goals can be modified to fit any age, gender body shape, and ability. Being mountain strong requires tremendous commitment and hard work. However, like a bank, the more you deposit in the form of effort, the more you can withdrawal in the form of improved attitude, efficiency, safety, comfort, and success not only in the mountains, but in everyday life. Train hard, train safe, and push yourself to a new level. 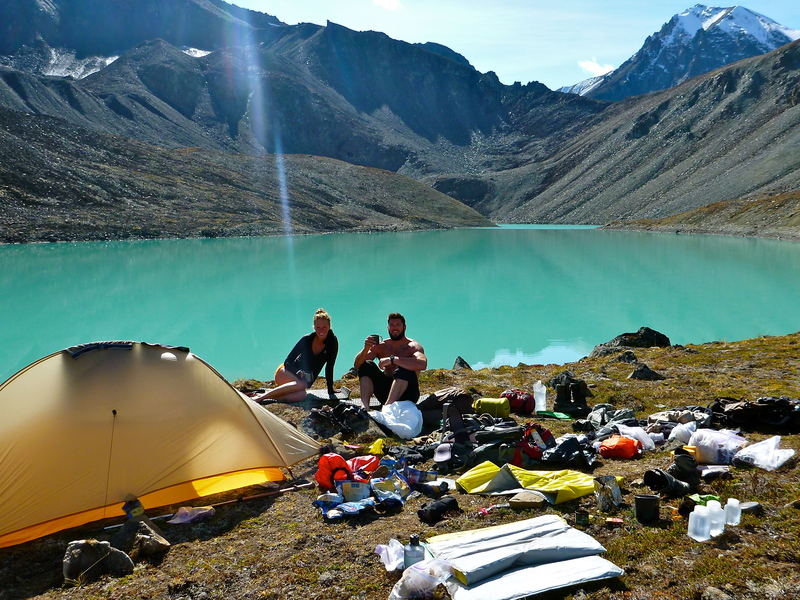 Packing out a bear in the Alaska Range, AK. Please consult your physician before beginning any exercise program. Harvesting Nature nor its authors assume responsibility for personal injury or property damage sustained by or through the use of this exercise.